Detailing the physical features, habits, territorial reach and other identifying qualities of the Southern Devil Scorpion. Not all scorpions are desert creatures and some, like the Southern Devil, prefer and thrive in a more tropical climate. The Southern Devil Scorpion is one of the few native scorpions found on the southeastern part of the U.S.. Most people associate scorpions with arid, desert climates, but this species has long been a resident in the more humid South. Unlike their Middle Eastern cousins, the poison of most North American scorpions is not lethal though a few people may find themselves allergic, which can be medically serious. Despite their lack of deadly poison, their sting is certainly not painless. The area of a scorpion sting usually becomes swollen and red, remaining painful and tender for some time. Medical attention may be necessary if symptoms persist or become worse. Despite their reputation, most scorpions do not set out to attack people. They are nocturnal and are more active at night, wandering around for prey. Because of this, many human campers shake out their sleeping bags before bed as well as their shoes before putting them on the next morning to avoid accidental close contact. During the day, scorpions rest underground. They can be found in leaf piles, and under wood stacks and stones. They may venture into homes and are commonly found in cellars or crawlspaces. The natural prey of the Southern Devil Scorpion consists of spiders and other large insects. The stinger on the tip of the abdomen, or tail, is used to inject the poison and kill its victim. It may also aid in pinning the victim down until it dies. The pincers of the scorpion are used to grab and pull prey apart. Males use these two weapons against other intruding male scorpions. During mating, the male and female clasp each other's claws and dance. Females can give birth to 25 - 80 offspring, one at a time, a few months after mating. 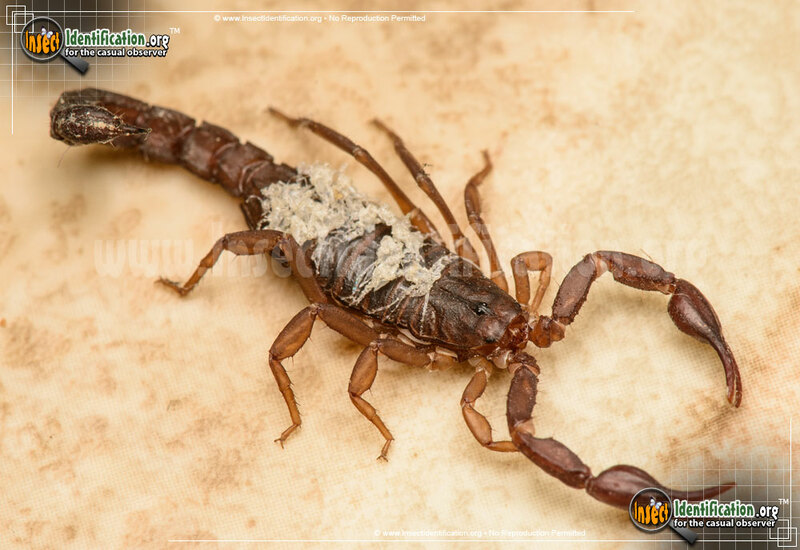 Lighter colored immature scorpions are vulnerable and reside on their mother's back for about 4 weeks until they reach their molting stage. They then shed their exoskeleton for a larger, more durable one and leave their mother after the process is complete.